Apple co-founder Steve Wozniak told a crowd today of an unintentional acceleration problem with his 2010 Toyota Prius, which isn't under a recall. "This is software. It's not a bad accelerator pedal," he told the crowd. "It's very scary." I have many models of Prius that got recalled, but I have a new model that didn't get recalled. This new model has an accelerator that goes wild but only under certain conditions of cruise control. And I can repeat it over and over and over again—safely." He's not the first one to bring up a potential software issue related to the acceleration problems, but his word carries extra weight because of his experience with software and computers. It's important to note cars like the Toyota Camry have a drive-by-wire throttle system and the gas pedal isn't actually connected mechanically to the engine but relies on software to read inputs and control acceleration. According to the Los Angeles Times, "two former NHTSA administrators, Ricardo Martinez and Joan Claybrook, have said they believe that some kind of electronic glitch may be causing the Toyota problems. Similar conclusions are being drawn by independent automotive safety experts, forensic mechanics and automotive electronics researchers, as well as many consumers." If this turns out to be the case it could widen the scope of NHTSA's investigation. Toyota did say it would upgrade it's software to allow for a brake override system, but this doesn't seem to be related to Wozniak's issue. We'd certainly like to take a spin with the Woz and see him duplicate this to make sure this isn't just him not understanding how the cruise control works. 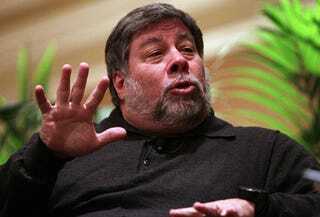 UPDATE: The Woz himself responds with more information about what's going on. UPDATE II: Toyota, with a little help from Jalopnik, has reached out Wozniak and the company is going to borrow Steve's Prius.